Clarification of the roles and responsibilities of the Laser Safety Officer (LSO), Deputy LSO, Laser Safety Site Contact and Laser Safety Specialist, with additional information regarding these positions discussed in a new normative appendix. Introduction of the newly defined Class 1C, intended for laser products used essentially in contact with the skin. Greater detail on laser generated airborne contaminants (LGAC) and plume and airborne contaminants (PAC). Expanded guidelines for third-party laser rentals. More clearly defined control measures; changes to area warnings signage in both design and signal words. View a Sample of this publication (includes the Table of Contents). 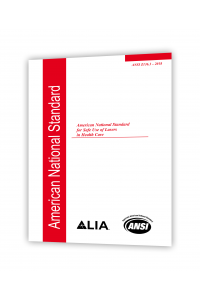 Order an electronic (single-user PDF) version of this standard. For site license inquiries, please contact Mark Brown, Director of Sales (ANSI), +1.212.642.4935.